A Problem with Sola Scriptura? If we test/verify everything by Scripture, how do we verify the list of 66 books using Scripture alone? To ask it another way: Since the table of contents in our Bible is not inspired, it must be what we, as Protestants, would call a man-made tradition that must be tested by the light of Scripture. But what purely Scriptural test can we perform on that table of contents to determine that the books listed there belong in the Bible? If we cannot verify it using Scripture alone but must go outside the Bible to verify it, aren’t we just accepting a “man-made tradition” as infallible without Scriptural proof? Having said that, I will point out that in spite of this issue with sola Scriptura, I am not prepared to jettison it. The alternative to it is to head to Rome, but there one will find countless volumes of church teaching and canon law and, therefore, even more questions—not to mention a “gospel” that shifts the burden of salvation from Christ to the individual believer. The situation would not be much better if one went to the Eastern Orthodox Church. Does Luke 1:28 Really Say That Mary Was “Full of Grace”? It seems clear that the Greek text underlying the description of Mary indicates something entirely different. 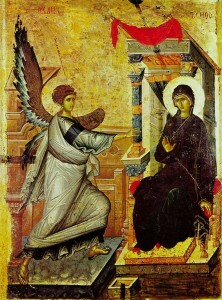 Since the word πλήρης (full) does not appear in that description of Mary, there is no indication that the author intended to describe Mary as being “full” of grace. We can definitely conclude from that text that she was favored. We can even conclude from the context that she was highly favored, since she was to be the mother of the Lord—truly a unique, special role—and that she should be honored. We can also conclude from the perfect tense that the favoring had begun at some point in the past and had continued to the present time (from the standpoint of the speaker). Perhaps it’s true that Mary was “full of grace,” but I’m not so sure that it can be proven from Luke 1:28. Unfortunately, what they don’t seem to realize is that no evangelism is ineffective if it includes proclaiming the gospel and is devoid of unnecessary offenses. What is ineffective is the human heart’s ability to respond favorably to that message about Christ. This is not to say that any of the aforementioned methods are wrong simply because they do not appear in Scripture. In fact, some of these approaches may be useful in certain situations. The problem happens when they are lifted up to the same level as gospel proclamation and seen as equal to it in efficacy, as though gospel proclamation were optional—just one method to choose out of many. Thus, it is wrong to see any one of them as the single, long-sought-after silver bullet that will slay sin and resistance to the gospel once and for all. These various techniques are specific tools to stow away in one’s evangelistic toolbox, not as one-size-fits-all techniques but as implements to be retrieved when a particular occasion requires them and as support for the verbal communication of the gospel. In all our methods, tactics, techniques and procedures, we need always to keep at the forefront of our minds this biblical truth: The gospel message is the method. It is the gospel that has power (Romans 1:16, James 1:18), not the various methods that we devise. We must always remember that. Two Different Gods in the Old Testament and the New Testament? Many people contrast the portrayal of God in the New Testament with that of God in the Old Testament and conclude that they were two different deities. They feel that the God portrayed in the Old Testament was harsh, cruel, judgmental and quick to anger, whereas the God of the New Testament is fatherly, loving, tender and merciful. This is actually a false dichotomy. Ironically, it is in the very act which we rightly see as the greatest act of mercy—Jesus hanging on the cross and bleeding for our sins—that we see the same Old Testament holiness, severity and judgment. Christ’s self-sacrifice was the result of both unrelenting judgment and the tenderest compassion: God’s holiness and justice required that the full penalty due humanity for their sins be satisfied, and He gave up His own Son compassionately to accomplish that. Mercy and justice are both seen on Calvary’s cross, just as they are both seen in the Old Testament. God did not change between Malachi and Matthew. One day that stern holiness of God will break out against sin forever. It will be the unleashing of a righteous hostility toward evil that will never end—like a massive flash fire that suddenly breaks out and whose fury never ceases. Christ’s shed blood on the cross, however, is a complete satisfaction and appeasement of that righteous anger toward sin. When God sees that blood applied to a believer in Jesus, He has no wrath whatsoever toward that person: “Whoever believes in him [Jesus Christ] is not condemned, but whoever does not believe is condemned already, because he has not believed in the name of the only Son of God” (John 3:18, ESV). The God revealed in the Old Testament is exactly the same God revealed in the New: loving and merciful and kind, yet also fearful and terrifying in His wrath. He is not to be trifled with. Don’t make light of Jesus’ death and suffering on the cross. If you reject it, you have nothing to look forward to but an eternity of suffering God’s holiness breaking out against you in hell. Repent and come to Christ now! This has long been one of my favorite messages. Some people may want to come to Christ because they are genuinely concerned about their salvation but might have doubts about whether the gospel is meant for them. Ralph Erskine does a great job assuring such people that the word of salvation is truly meant for them. It is well worth taking the time to read it through. It’s a common debate between Catholics and Protestants: The Protestant will quote the above verse to disprove the Roman Catholic teaching on Mary as co-mediatrix with Christ. The Catholic will respond by pointing to verse one of the same chapter, where Paul urges that “supplications, prayers, intercessions, and thanksgivings be made for all people.” So all Christians, the Catholic says, are called to be mediators between God and men in some way. Why, then, can’t Mary be a co-mediatrix with Christ? Despite the disclaimer at the end of this paragraph, the boldfaced text above indicates that the Catholic Church clearly attributes to Mary a role that goes beyond mere intercession into the realm of “bring[ing] us the gifts of eternal salvation.” Moreover, her duty is called salvific, and she is said to care for Christians. In fact, the Catholic Church portrays Mary as holding an office that is remarkably like that of Christ’s, calling her Advocate and Mediatrix. Therefore, the Catholic implication that Mary’s mediation is like the limited mediation described in v. 1 falls flat. So when Catholics respond to the Protestant’s use of the above verse by saying that Mary’s mediation is like the lesser form described in v. 1, they are really going against what Lumen Gentium says. In reality, according to official Catholic teaching, her level of mediation resembles Christ’s in striking respects. There are people today who separate themselves from the local church and feel they are perfectly justified in doing so. The New Testament, however, has much to say about this, and when we look at relevant passages, we can see that doing so is a dire sin. The Scriptures know nothing of living the Christian life by oneself, in isolation from the body of Christ. If you don’t long for fellowship with other children of God, do you really love God? It is impossible to obey this passage’s command to use our gifts to serve one another if we are not plugged into a local body of believers and involved on a regular basis. Our spiritual gifts are given to us to “serve one another,” as the text plainly says, not to keep them to ourselves. If we don’t use our spiritual gifts to serve others, are we perhaps like the man in Jesus’ parable who buried his talent and hid it and produced no profit with it (Matthew 25:14–30)? This text not only commands us to maintain the unity of the Spirit in the bond of peace, but it says to be eager to do so. That means we should go out of our way to maintain unity in the church. It is obvious that those who separate from the church are doing the opposite because they are contributing to disunity. Breaking off and separating—unless they have good biblical reason to do so—simply fractures the church further than it already is. Continuing in Ephesians 4, we see another indication why separating from the church is sinful. Christ Himself gave gifts to the church: apostles, prophets, evangelists, shepherds and teachers. If we separate from the church, we cut ourselves off from those gifts and essentially say that we don’t need them. That is certainly contrary to God’s will. The gifts mentioned are absolutely vital to the church’s life, health and growth, and so cutting ourselves off from them will result inevitably in a decrease in our own spiritual health. 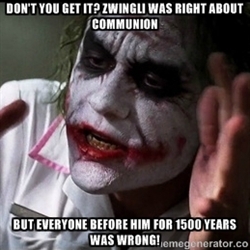 Again, that is something contrary to God’s will. Here the apostle explains why the aforementioned gifts of men to the church are so vital to her health and growth. It is through them that God equips the saints for ministry, builds up the body of Christ, and brings the church to maturity for her protection from error. To separate oneself from the church, then, is to remove oneself from God’s divinely appointed means of spiritual growth and protection. Can that be anything less than dangerous, not to mention an affront to our wonderful Christ, who graciously provided those gifts? Notice that Paul here not only mentions growing up but specifically growing up into the head, Christ. He also mentions that Christ is the source of that growth. There is, then, no growing apart from being connected with the church, and particularly with those men whom Christ has given as gifts to the church. Unless otherwise noted, scripture quotations are from The Holy Bible, English Standard Version® (ESV®), copyright © 2001 by Crossway, a publishing ministry of Good News Publishers. Used by permission. All rights reserved. 7 “Ask, and it will be given to you; seek, and you will find; knock, and it will be opened to you. 8 For everyone who asks receives, and he who seeks finds, and to him who knocks it will be opened. 9 Or what man is there among you who, when his son asks for a loaf, will give him a stone? 10 Or if he asks for a fish, he will not give him a snake, will he? 11 If you then, being evil, know how to give good gifts to your children, how much more will your Father who is in heaven give what is good to those who ask Him!” (Matthew 7:7–11, NASB). I like to say to others, “You can’t get to the bottom of God’s goodness.” How true!